As a result, Gang Green will be one of a number of teams vying to attract impending free agent Kirk Cousins. The Redskins and Cousins will part company after the NFC East side acquired Alex Smith from the Kansas City Chiefs in a trade deal. Cousins has performed at a solid level for Washington since replacing Robert Griffin III as their starter in the 2014 campaign. He would provide a huge upgrade for the Jets at the position and could see them challenge at the top of AFC East for the first time since Rex Ryan's golden run of two AFC Championship appearances on the bounce in 2009 and 2010. The coming campaign could offer the Jets the opportunity to win their division for the first time since 2002. However, if we were to base our hopes on their current odds across bookmakers' offerings for a Super Bowl win, the prospects aren't exactly bright. Recent history has not been kind to the Jets since they last took a major plunge in drafting a quarterback in 2009. To this effect, we thought it would be better to dwell on happier times, so we decided to take a look back at the best of the club over the past 10 years. Unfortunately for the Jets, Fitzpatrick is as good as it has got from the quarterback position. He didn't arrive to much fanfare, following inconsistent spells with the Buffalo Bills, Tennessee Titans and Houston Texans. However, the veteran put forward an outstanding campaign, throwing for 3,905 yards along with 31 touchdowns to just 15 interceptions. His form alone was one of the driving forces of taking Bowles' men to the brink of the playoffs, only to miss out on the final game of the 2015 season. 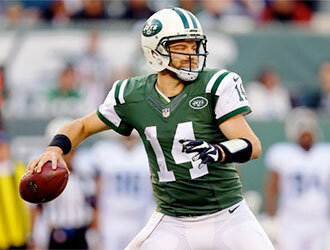 Fitzpatrick had only a one-year deal in place, and the Jets were unable to strike an agreement with the quarterback until July 2016 - just six weeks before the start of the term. Fitzpatrick regressed to his old ways with a number of poor outings to send New York tumbling to a 5-11 record. Although the Jets were not successful last season with McCown at quarterback, the presence of the veteran at signal-caller prevented what could have been a 0-16 campaign. If Jets fans were not happy about securing a top-three pick in the 2018 Draft - just look at the turmoil and humiliation the Browns endured last term and be glad for not going through that situation. McCown was a solid operator and was able to get the best out of an average at best receiving corps. Robby Anderson and Austin Seferian-Jenkins became reliable targets down the field, with the 38-year-old throwing 18 touchdowns to just nine interceptions over the course of the term. It would not be a surprise to see the club bring McCown back for the 2018 season - even if it's just to provide a leadership presence. Sanchez was the great hope for the franchise when they moved up in the 2009 Draft to select him with the sixth-overall pick. The former USC quarterback made mistakes in his rookie term, throwing 20 interceptions and only 12 touchdowns. However, the defense and a strong running game propelled the club into the playoffs and their subsequent run to the AFC Championship game where only the Indianapolis Colts powered through them. 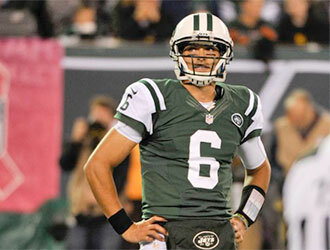 Sanchez improved slightly in the 2010 campaign as an 11-5 campaign saw Ryan's men through to the playoffs. He put forward an outstanding display to beat the New England Patriots in Gillette Stadium, throwing three touchdown passes. Sanchez's limitations were on full display in the AFC title game as the Jets crashed out on the road to the Pittsburgh Steelers. Sanchez was never able to make the jump even to becoming a mediocre quarterback. He was always below average, struggling immensely in 2011 and 2012 before a pre-season shoulder injury in 2013 marked the end of his career in New York. In terms of the three quarterbacks mentioned, Cousins is far above their standard of play. The 30-year-old almost threw for 5,000 yards in the 2016 campaign. In his three years as a starter, his quarterback rating has been 93.9 or above, climbing as high as 101.9 in 2015. The Jets are desperate for that elite play from a quarterback over a sustained period of time. Cousins has thrown 81 touchdowns to 36 interceptions in the last three seasons, highlighting his quality. He did have talent around him in his opening two campaigns. However, last term, he proved that he could compete at a high standard even with key departures and a number of injuries in his receiving corps and offensive line. It will not be easy for the Jets, but they have to put every effort into challenging for his signature.